Incredible results and inspiring journeys! 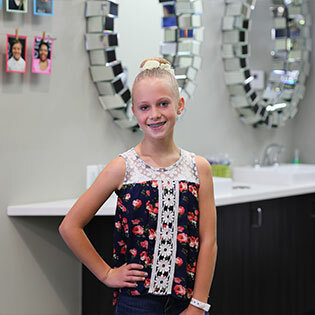 See some photos of actual ABC Orthodontics patients below. When a patient's upper jaw sits on the inside of the lower jaw, whether on the right, left, or front teeth, this is called a crossbite. When the jaws do not align, the lower jaw must compensate forward or to the side to allow the teeth to come into contact for chewing. This shift of the jaw will cause asymmetric growth and deviation of the chin. Uncorrected malalignment over time will cause uneven wear of the enamel surface of teeth as well as wear and stress to the jaw joint (TMJ). Crossbites are best corrected early to prevent asymmetric growth of the jaw or chin. Crowding simply means we do not have enough room for all of the teeth to be present and in alignment! The most common reason for crowding is inheriting disproportinate tooth size and jaw size from mothers and fathers. When we see crowding, it is important to correct for both function and aesthetics. While aesthetics are important, when teeth overlap or rotate, it is difficult to keep them clean, which makes you more susceptible to cavities and gum disease. As you can see, straight teeth are both beautiful and healthy! Early treatment will be recommended for children who are identified to have severe crowding, severe bite discrepanacies (overbite or underbite), airway problems, congenitally missing teeth, impacted teeth or prolonged thumb-sucking habits. Early orthodontics with expanders and limited braces can successfully prevent more aggressive treatment options in teens and adults, by utilizing facial growth in a young child to correct developmental problems. An openbite is often the result of a prolonged thumb-sucking or tongue-thrust habit in which you do not see the top teeth overlap with the bottom teeth. Typically, greater success is seen by treating an openbite as soon as possible and can greatly improve both speech and chewing. Openbites that are left untreated for prolonged periods of time will often require surgical intervention and myofunctional therapy to correct. When patients have space between teeth, it can cause problems with food impaction, which leads to decay on the surrounding teeth or severe gum irritation. In addition, patients often want spaces to be closed for aesthetic reasons. Spacing can often be simply closed with orthodontics; however, if the cause of the spacing is due to missing teeth, it may need to be addressed with our office and your general dentist to determine a suitable replacement for missing teeth. An underbite is described as the bottom teeth resting in front of the top teeth when the patient’s jaw is closed. An underbite will likely pose aesthetic and functional problems for patients and should be evaluated early in a child’s life (age 7) to determine if the cause is a small upper jaw, large lower jaw, or combination of both.